The 3/8-inch circular metal sensors connect with the user’s skin to analyze electrical information from the brain toward the missing limb. This allows the person to perform complex motions naturally. The device houses four bendable, rechargeable batteries with voltages that range from 6 to 14.4 volts. The batteries are good for up to eight hours of use and last approximately 18 months. Jodie O’Connell-Ponkos will never forget the first day of summer before entering her junior year in high school 32 years ago. On that day she was working at a deli in Bradford Connecticut. While pushing meat into an active meat grinder, her fingers got caught pulling in her arm. 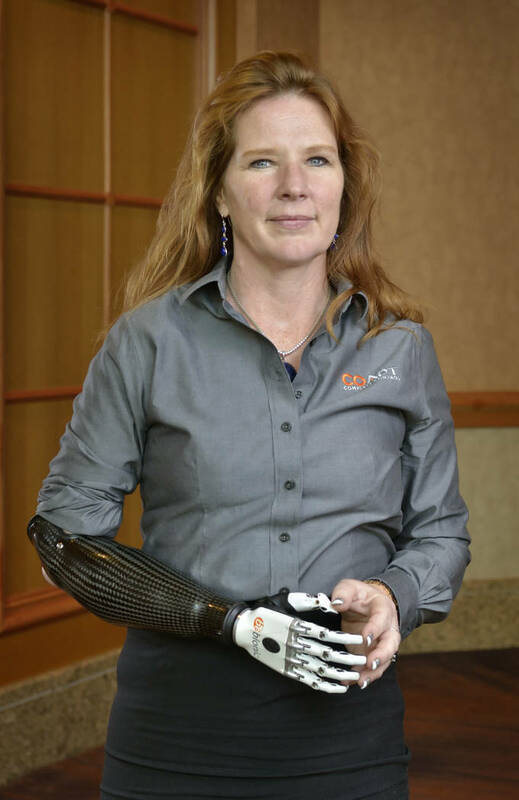 Losing half her right arm and hand, O’Connell-Ponkos had to learn to do life differently — choosing to go without the use of a prosthesis. Her view on prostheses changed about two years ago when she learned about andeveloped by Coapt, a small niche company based in Chicago. Coapt’s Complete Control system allows the amputee control over their device through their thoughts. 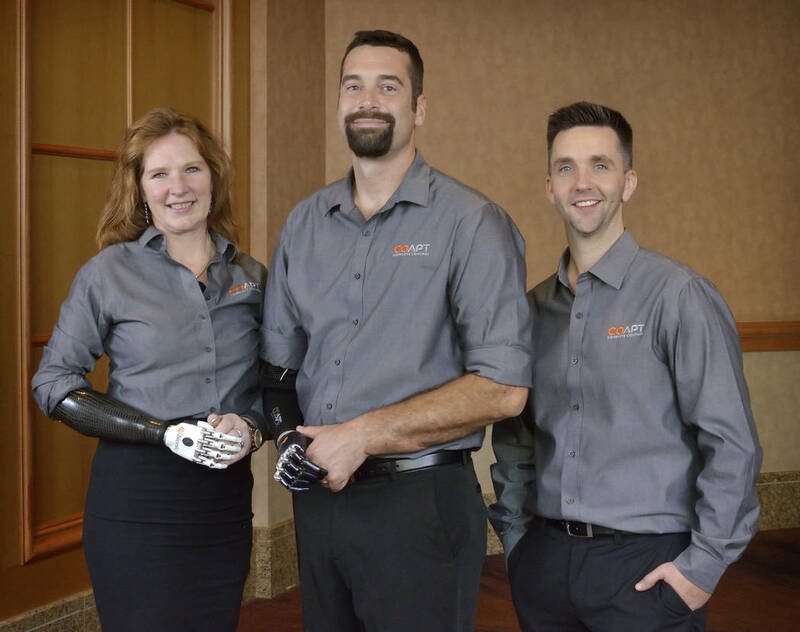 Coapt demonstrated its Complete Control system during the 100th annual American Orthotic & Prosthetic Association’s World Congress held early September at Mandalay Bay. Lock describes the prosthesis’ ability to translate the body’s electronic pulses similar to a voice recognition system. “The system runs on similar mathematical algorithms to voice recognition systems but has to do so with more challenging input signals,” Lock said. “Every intended arm or hand motion gives off a subtly different pattern or signature of muscle signals. It’s like every muscle is a different radio station and they’re all playing at the same time. Going through a set of programmed movements, the user gains proficiency controlling the limb. The first time O’Connell-Ponkos was fitted with a test socket, she was stacking cups and moving blocks. It also functions with different degrees of amputation. At the convention, O’Connell-Ponkos and Retired U.S. Army Sgt. First Class Glen Lehman — both considered Coapt Patient Advocates — showcased different ways the technology can be adapted. Turning their hands or moving their arms naturally without much thought. O’Connell-Ponkos’ device is attached below her elbow. 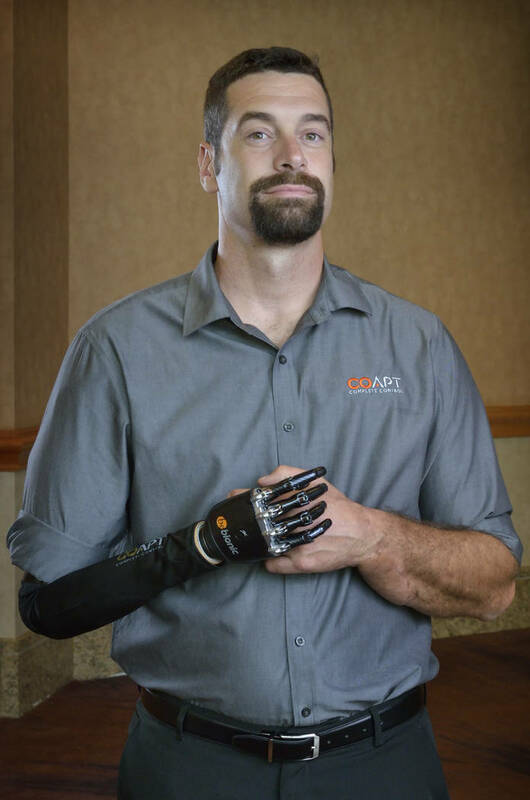 Lehman lost most of his right arm when an improvised explosive device exploded his Army convoy in Iraq. His device is attached above the elbow incorporating a more complex set of motors including an elbow joint. A recalibration function allows the user the ability to reprogram the arm with a touch of a button. The recalibration runs through specific programmed movements while the user mimics the movements in their thoughts. The system adapts by listening and learning the signals for each muscle movement. 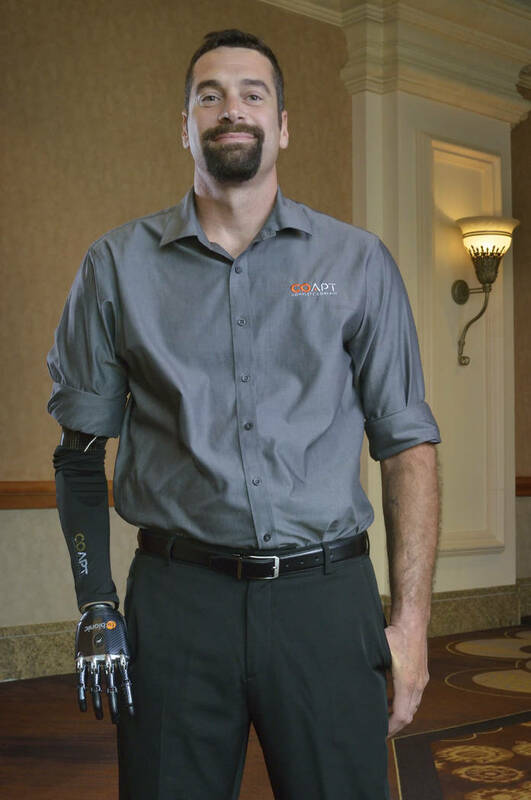 Coapt’s Complete Control system can be adapted and tailored to any prosthetic arm manufactured. Movement is dictated by the type of device the amputee is wearing. A prosthetic arm costs on average between $50,000 to $150,000. The Coapt system costs an additional $15,000. Coapt’s system and several stainless-steel sensors are housed under the plastic outer shell of a prosthetic arm. 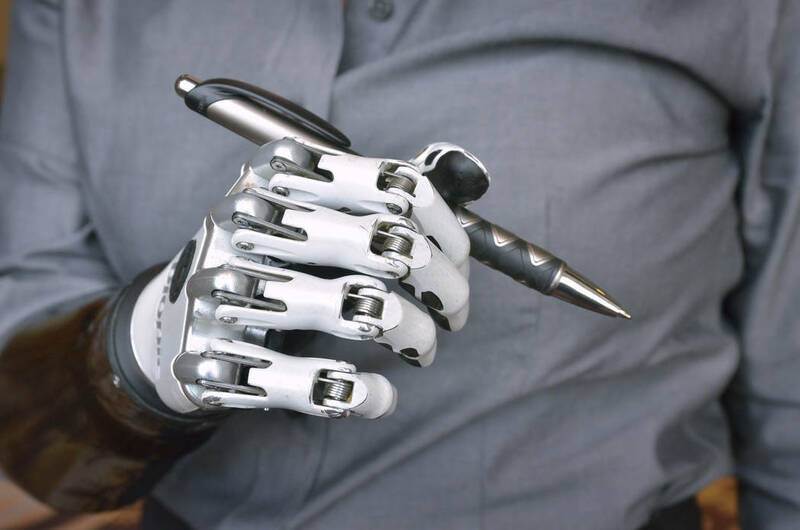 According to Lock, the specialized technology Coapt markets and sells is a product of 30 years of research, designed specifically to control arm prosthetics. Research continued for 53 years, through several interconnected groups, working around the world, decoding people’s thoughts and actions. Lock first learned of the academic research when he went to work for the Rehabilitation Institute of Chicago (RIC) in 2005. He realized it was time to release the software after years of successful clinical trials and medical professionals requesting the software. Lock, along with co-founders Todd Kuiken, Levi Hargrove and Jonathan Sensinger formed Coapt in 2012, releasing Coapt software commercially the following year. Lock is the CEO and active partner in commercializing the product. Coapt signed a traditional licensing agreement with a royalty going back to RIC per device sold. Coapt sells the devices to medical professionals trained to fit amputees, who can attain a Coapt device through a prescription given by their physician. Coapt is selling the devices in the United States, Lock estimates they reach between 300 to 500 patients a year, 10-15 percent of the market share. Lock plans to expand globally this year after releasing a second generation of the software. The expansion will be executed through regional distributors. Earning approximately $2 million in annual revenue, the company employs 10 employees. Funding comes primarily through commercial revenue with 15 percent of it coming from grants and paid research.